The major challenge is to efficiently utilize transportation resources with respect to increase in demand and to provide cost effective rides to users. Besides mobility, the other challenge is to efficiently and effectively form a community of common interest (CoCI) on an ad-hoc basis, which requires the satisfaction of several constraints for group mobility such as unfamiliar environment, old age people, language barrier, fear of travelling alone, lack of knowledge about roads and surrounding areas, and ambiguous travel plans. Similar scenarios may arise in other situations such as tourism, Olympic Games, tournaments, KumbhMela, etc. Announce them within a huge crowd to find and create social network of CoCI. Form a CoCI via sharing and locating each other using text, images, audio and video. Share their constraints such as maximum fare that they can afford,time of traveling, pick up points, languages or company preferences, etc. Allow broadcasting the constraints along with multimedia information such as location, images of persons and surroundings, etc., with the taxi drivers in a certain geo-zone . 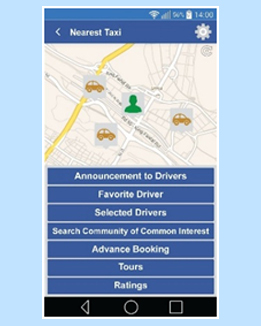 Make taxi owners within the geo-zone respond to the group with multimedia information such as image of the taxi and driver, number plate, make and model etc. Meet with CoCI at a certain place, by allowing them to share their geo-tagged multimedia information for efficient rendezvous point discovery and share with the vehicle owner. The system allows a vehicle’s owner to share real-time locations with CoCI as well.